If you take your great outdoors with a dash of adrenalin, then we’ve got your down south bucket list sorted. Grab your hard hat and check out some of these lesser-known adventures activities in Margaret River and Busselton. Most of these experiences are suitable for kids of a certain age and all showcase the spectacular Margaret River region. Buckle up for a breathtaking ride. 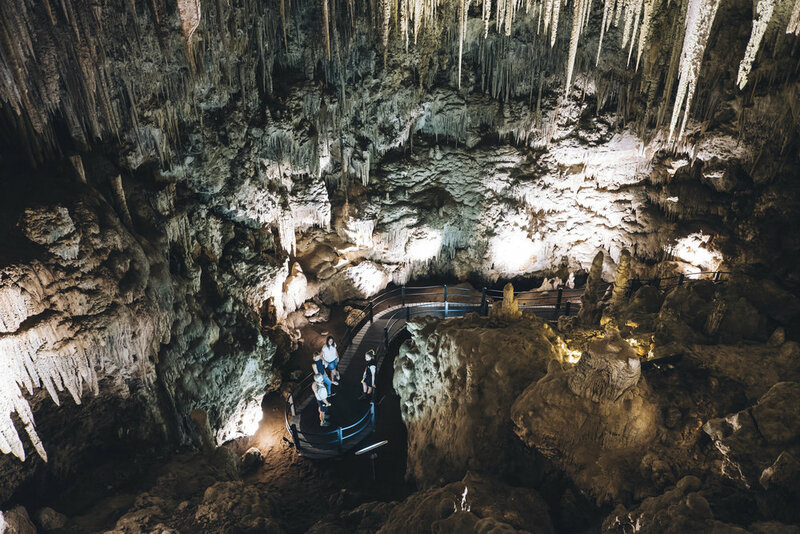 Ngilgi Cave is a family-friendly cave where you can take a semi-guided tour along the boardwalk, marvelling at ancient crystal stalactites. Super safe, really nice, but it’s the Adventure Tours we’re here for today. Don a hard hat, head torch and gloves and get ready to go off-boardwalk with one of the super-knowledgeable guides. You’ll navigate the deepest, furthest parts of the caves, having to climb, crawl and squeeze through some pretty tight spots. There’s two tour options; the Ancient Riverbed is a 2-hour experience following the path the river used to take on its way to Yallingup Beach. It’s $75 for adults, $50 for kids aged 10+. We did the Explorer Adventure Tour, a 2.5 hour ‘choose your own adventure’ tour where you too might have a “how on earth will I squeeze through there?” moment at Pinch Gut. (You can do it!). It’s $98 for adults, $65 for kids 10+. Totally rewarding if you’re squeamish about heights, and bucketloads of fun if you’re brave. Forest Adventures South West is the only high wire ziplining course in the south west, and it’s an awesome adventure for anyone aged 7 and up. Set in the last remaining tuart forest in the world, you’ll fly through the forest on a zipline, snowboard and BMX between trees or climb between stirrups 13 metres off the ground. There’s six courses that get progressively harder, so start easy and see how much of a challenge you can bear. We loved climbing the totem pole, dangling 18 metres high in the air it’s the highest point in the course and has the most ziplines. The biggest challenge? The 13 metre base jump at the end of course six. You jump with nothing to grab onto, and for a second you think you’re going to fall, before the mechanism clicks in and controls your descent. Experts are on hand to help you master the safety equipment and deal with any nerves. The equipment is superb – a double carabiner safety system ensures you’re 100% secure. There’s nothing like the mighty Wilyabrup Sea Cliffs; 40 metres of red granite rock above a crashing sea. Abseil them, and as you tilt over the edge you’ll suddenly hear the ocean amplified off the cliff face. 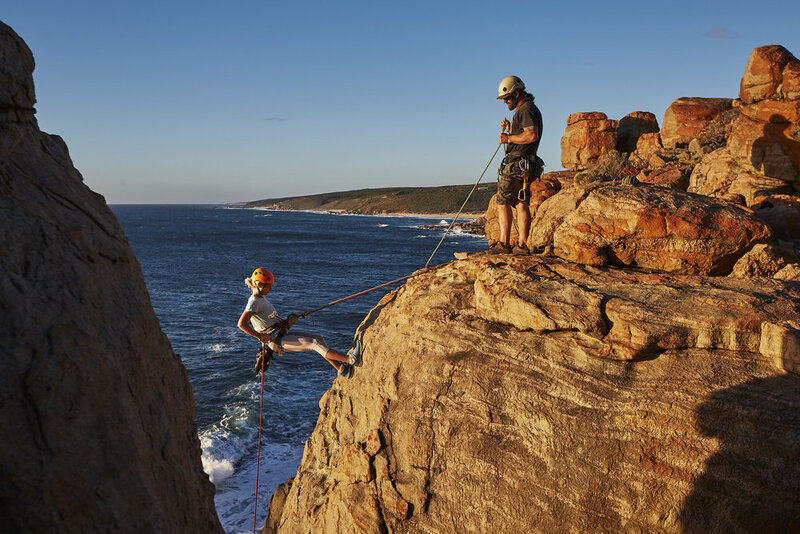 Mick from Margaret River Climbing Co will have you abseiling two of the most beautiful places in the region that you wouldn’t usually get to see. He teaches climbing and abseiling at the Wilyabrup Cliffs in the morning and Brides Cave in Boranup Forest in the afternoon. Newbies are welcome - Mick’s a great teacher and can cater to almost any level of ability. At Wilyabrup the ocean views are breathtaking and in spring you might even spot a humpback whale cruising past or a pod of dolphins. Half Day Abseiling/Climbing Wilyabrup Cliffs $130 per person. Full Day Climbing/Caving/Abseiling $250 per person. Suitable for kids aged 10 and over. Hey, you’ve always wanted to go skydiving, and there’s no better time than while you’re on holidays. Skydive Geronimo takes off from Busselton airport and you cop the most sensational view of Geographe Bay, Busselton Jetty and some of the famous vineyards, getting a true sense of how big and beautiful Cape Naturaliste is. Weather permitting, you’ll land on the beach in Busselton, and it’s easy for your spectator mates to make their way from the airport to the beach in time to see you land. If you can’t convince them to jump too, that is. The Geronimo crew split their time between beautiful Busselton and sunny Broome. You’ll find them operating in the south west from mid September to the end of April. Jumps start at $299 for an 8,000 ft jump with a 20 second freefall. The most popular jump is $399 for a 14,000 ft jump with a 60 second freefall. Hands-down one of the most addictive ways to see the south west is by helicopter. 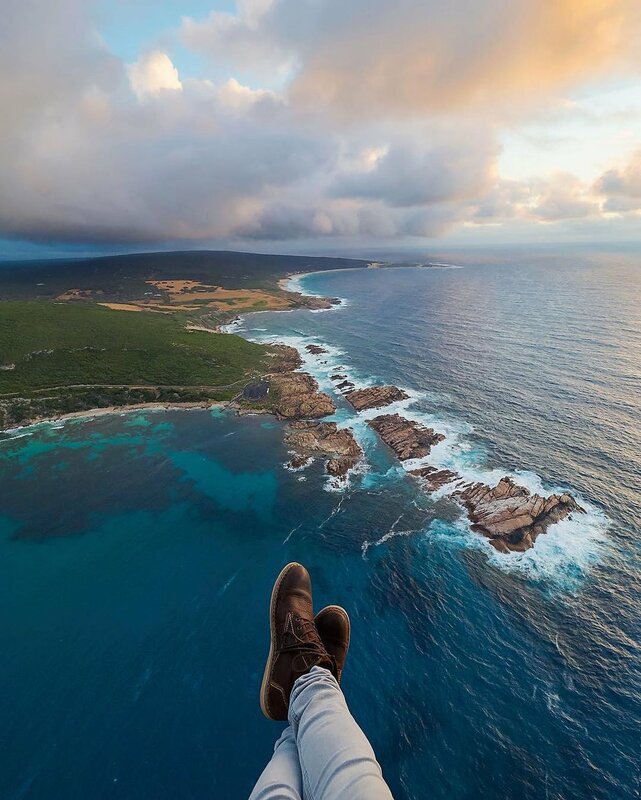 Jackson from Scenic Helicopters is third generation Margaret River and knows the coast (and all the stories) well, pointing out all the sights as you fly along – caves dolines, Wilyabrup Cliffs, whales, wineries and much more. You can land celebrity-style at your favourite winery, picnic at a secluded beach or splash out and see the entire Leeuwin-Naturaliste Cape to Cape by air. His Robinson R44 has space for three passengers – and you can fly with the doors off to make it that much more exhilarating. Hey, if you’re looking to bush-bash through Boranup, keep walking – this is a quiet and gentle ride through the giant karris. The thrill is being surrounded by such a majestic forest. Boranup Forest is a remarkable place – thousands of karri trees on undulating land between Caves Road and the pristine beach. Clearfelled in the late 1800s it was replanted which is why the trees are so uniform; they’re all the same age. EcoAdventures’ electric quad bike tours allow you to quietly explore this beautiful and peaceful place. The quad bikes were engineered to run on electricity – about $1,80 worth per 100km. The environmental footprint is minimal; they’re quiet and have no emissions or fumes. Tour guide Gary is keen to protect the forest tracks, flora and fauna, and shares the history of the region, and the beautiful forest. You’ll cruise past Devil’s Lair, where the remains of a Tasmanian Tiger were found, see a 500-yearold karri tree and gaze in awe at magnificent coastal scenery. Family-friendly: children aged four years+ can sit in front of the driver. $95 Adult. $55 Child. Blitzed them all and you’re looking for more? Try mountain biking the new tracks around Margaret River and Meelup, kayaking the Blackwood River or Coasteering with Margaret River Adventure Company. With this many exhilarating adventures to be had in the south west, you might just need to extend your holiday. After living in Melbourne and London, Lizzy meant to have a summer in Yallingup before getting a “serious” job in Perth. Ten years on, and she loves Dunsborough too much to return to city life. Lizzy’s taken helicopter rides along the coast, distilled her own batch of gin, abseiled the Wilyabrup Cliffs and crawled through crystal caves to help bring you the best of the south west.